Garlic Butter Steamers – New England steamers (soft shell clams) with garlic herb butter. A 15-min recipe that is easy and delicious! Garlic Butter Steamers – New England steamers (soft shell clams) with garlic herb butter. A 15-min recipe that is easy and delicious. Last weekend, we went to Redondo Beach to celebrate my friend’s birthday. Redondo Beach is probably one of my favorite places to go to in the Los Angeles area, not because of the spectacular views and the nice beaches, but for the seafood. If you are a local or have visited Redondo Beach, you will know that locals and tourists alike flock there because it offers the freshest seafood in the area, with many seafood shacks selling everything from fresh oysters to crabs crab or lobster, and more. One of the shellfish that I absolutely love but can’t get easily is soft shell clams or New England steamers. They have thin and fragile white-color shells, with siphon sticking out. Soft shell clams are extremely briny and sweet in taste, and the flesh is very tender and juicy. All I did was steaming them with a little garlic, herb and butter, with some white wine. I would always guzzle the delicious clam juice until not a single drop left. 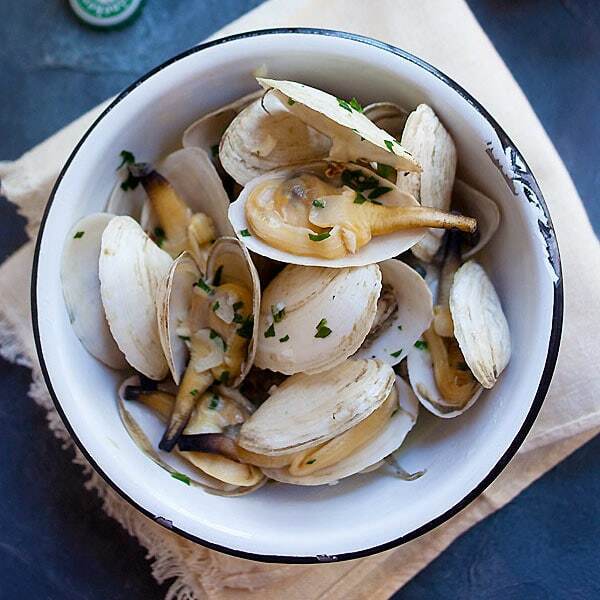 If you can’t find steamers where you are, you can certainly use any clams you can find in your area. There are also similar recipes that you can try: Thai steamed clams, ginger and clam soup, Taiwanese-style clams, and steamed Asari clams. Bon appetit! Garlic Butter Steamers – New England steamers (soft shell clams) with garlic herb butter. A 15-min recipe that is easy and delicious. Heat up a small pot and add the melted butter. Saute the garlic until you smell the aroma, but not browned. Add the soft shell clams into the pot, stir to combine well. Add the white wine and cover the pot with its lid. As soon as all clams open up, add the parsley and salt to taste. Serve immediately. There is a thin grey-color membrane that covers the soft soft clams. Remove the membrane thoroughly before eating. All photos and recipes on Rasa Malaysia are copyright protected. Please do not use the photos and recipes without prior written permission. If you wish to republish this recipe, please rewrite the recipe in your own words instead of copy and paste and link back to //rasamalaysia.com/soft-shell-clams-steamers-with-garlic-butter/. Thank you very much! I live in the New England area, yes, these steamers are a must-have for summer months, they’re excellent. Yes, it’s a summer recipe. It’s not very timely as it’s already September but in where I am, it’s summer until November. But anyway, I can eat this dish every season. I absolutely love shell fish! Everytime I go grocery shopping here in Malaysia, I’d go to the aquariums and pick out at least a pound of whatever shellfish I fancy for the day and then I stirfry it in HIGH HIGH heat with nothing more than ginger and red chilli slices and a pinch of salt. So good! I’m a big shellfish fan as well! We don’t have this one but I am sure I can find similar at the market…must steam some up soon! How do you store your shellfish? I always cook mine the day I buy them but I was wondering, shellfish lover that you are, if you had any tips on storage? Thanks! This is one recipe that I’m trying as soon as I get these clams.. I look forward to all your recipes.. Have tried a few and they are all fantastic! They are good. But first remove the siphon and guts, don’t want to eat that.